When it comes to auto insurance, more coverage isn’t always better. It’s easy to fall victim to the fear of medical bills and repair costs, and many drivers opt for expanded coverage, even when it doesn’t make financial sense. The truth is, sometimes standard coverage is enough – especially when it comes to insuring a cheap car. Even the most basic Canadian auto insurance policy is quite comprehensive and drivers shouldn’t feel intimidated by sticking to the basics. The law requires Canadian insurers to provide auto coverage for drivers in three major respects. Basic policies have third-party liability insurance to cover third-party causalities or injuries in any given accident or collision. Provinces set the minimum rate of coverage independently -- in Ontario and Alberta, the minimum is $200,000. Basic policies must also have statutory accident benefits coverage. Regardless of who is at fault in an accident, this coverage ensures that the driver will be able to claim medical benefits. This will surely provide peace of mind to drivers fearing costly medical bills after an accident or collision. Those looking to insure a cheap vehicle should pay particular attention to the last component of coverage – the direct compensation and property damage coverage. The deductible is the magic number. It’s the point at which insurance will take over to reimburse you for property damage done to your vehicle. If your deductible is more than it would take for you to meaningfully repair or even replace the vehicle, more property damage coverage won’t do you any good. Buying additional insurance to cover mechanical failures, breakdowns, wear and tear, and acts of God will inflate premiums well beyond what one should be paying to insure a cheap car. Drivers will end up paying for damages out of their own pocket anyway on vehicles that are cheap to repair and replace since costs of repairing such vehicles will usually be less than the deductible of your policy. 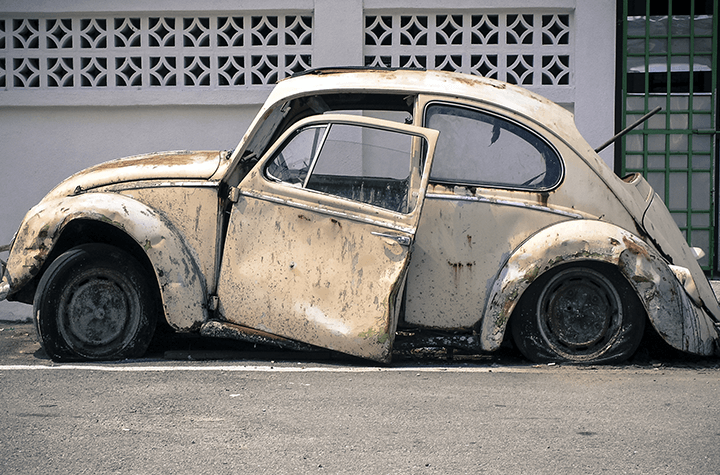 Should your car have property damage coverage? To determine whether you’re getting your money’s worth out your auto insurance’s property damage coverage, the following calculus is useful. First, estimate the average cost of replacing your vehicle. Do some research to determine the market value of your vehicle’s make and model. Subtract your deductible from this number – you, as the driver, are responsible for paying these damages out of pocket. Lastly, subtract the collision portion of your insurance premium from this number. What’s left is the amount your insurance will pay if a collision results in you having to write off your vehicle, and the number should give you a good idea of whether you’re getting your money’s worth from your insurance. It may also encourage you to stick to standard coverage.